Other photos on file from 1983, 1982, undated but probably about 1979. Limited architectural description on file from Herb Laglois, 1983; narrative text which follows based on Michael Way, 1982. See also "Presence of the Past", October, 1983. Located at the rear of lot 15, concession 3 in the former Township of North Gower is a green- trimmed, white frame house belonging  to Alex and Clayton Presley. Set well back from the Regional Road and partially hidden by trees, the house overlooks the now little-used Phelan Road which divides the farm from the next lot. The house was probably built around 1877 - 79 by John A. Eastman, a farmer and contractor of Loyalist descent. However, he sold the house and farm shortly thereafter, apparently in order to extricate himself from financial difficulties possibly arising in part from the fact that he may have underestimated his successful tender to build the Anglican Church - see "2372 Church Street". It is reported that Eastman had a tendency to overspend. He owned two pleasure carriages and more than two hundred dollars worth of farming implements by 1861, when most of his peers were making do with wagons and less sophisticated tools. He also invested more heavily in livestock than other farmers in the area. 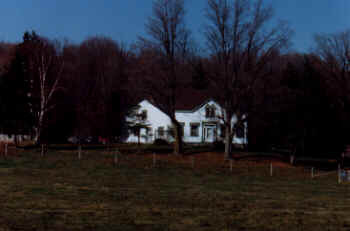 In addition, he incurred unnecessary expense in order to embellish his farm: the original fence posts used on the farm were all individually turned on a lathe in Osgoode, transported, and then painted white and green to match the house. Such preoccupation with detail must have been not only time-consuming but needlessly costly 35. The original fence posts have not survived [see footnote], and neither has the original drive that led formally to the front of the house from Phelan Road; it has been replaced by another that approaches less impressively from the Fourth Line. Even so, the building itself retains the key elements that distinguished it from neighboring dwellings: the four nicely proportioned windows that stretch across the first floor of the facade, and the unusual flat transom over the front entrance. First, the present  owners maintain that it was John Eastman who built the house, and estimate that he did so between 1877 and 1882. This information agrees with other indicators. Second, the rise in value of the property during the short period Eastman owned it suggests that substantial improvements were made to it during that time. Eastman gradually accumulated ninety-five acres over the seven year period between 1867 and 1874. He purchased three separate parcels of land during this span, of which the most costly was only $800. And yet, when he sold the entire farm in 1880, it brought $5,000 plus a $2,200 mortgage. Finally, between 1877 and 1879, Eastman mortgaged portions of the farm on three separate occasions. He successfully discharged the first two mortgages, which were for smaller amounts, but the last one had to be assumed by Robert Graham. Eastman obviously had a need for ready cash, and it seems quite possible that the money was used to finance construction of his home. "This is an extraordinarily well detailed wood frame farmhouse in Classical Revival Style enhanced by features of Gothic Revival design. Accordingly, it is considered to be of architectural interest. Constructed circa 1870 - 77 [sic], this outstanding 11/2 storey residence is distinguished by its handsome moulded eaves, cornerboards and by its front entrance with rectangular transom and sidelights surmounted by a double gable window. 35 So reports our chronicler, who telegraphs his own priorities! Another interpretation would acknowledge that Mr. Eastman may have been a farmer ahead of his time, and credit him with values beyond the merely utilitarian. Some of the fence posts described in this paragraph survived until the 1980's on Phelan Road and along the unused laneway to the house from the south; there is no evidence on file to show whether they were installed by Mr. Eastman or by his successor, Mr. Graham. It seems likely that turned posts were used only in showplace locations, and not throughout the farm.